We decided early on that the surest way to completely secure your information would be to build our own CLIA-certified laboratory. And that’s just what we did. Once we receive your saliva sample in our lab, your DNA never leaves the building. As a matter of fact, we place it in our proprietary DNA Lockbox for safekeeping. No other DNA testing firm offers this level of security. Others send your DNA elsewhere for testing, even to non-secure overseas locations! Pathway Genomics hired some of the leading genetic genealogists in the world to design a custom analysis with the most precise and thorough genetic ancestry testing available.Â Our maternal and paternal tests are 10 times more precise in their definition of haplogroups than other services, with more than 1000 maternal and over 200 paternal haplogroups. 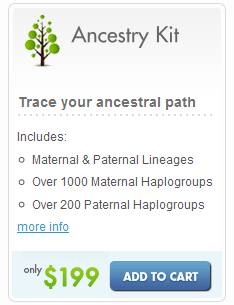 This means that where other services will tell you that you are in Haplogroup J, we can tell you that you are in Haplogroup J2a1a â€“ it is like the difference between saying you drive a Japanese car and saying you drive a 2009 Toyota Camry XLS.Â By identifying your ancestry more precisely, Pathway Genomics helps you to identify people with whom you are more closely related. 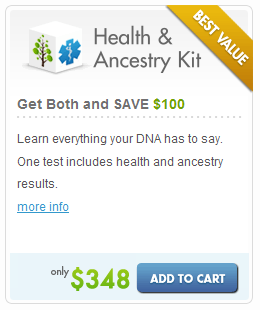 The Ancestry FAQ page has more information about ancestry testing. 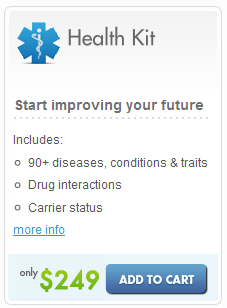 As the Health Kit above describes, the test examines SNPs related to more than 90 diseases, conditions, and traits, as well as carrier status of some genetic conditions, and drug interactions.Â Lists of some of these conditions are here, here, and here. In addition, because of the complexity and inherent uncertainties in genetic information, it is recommended that you discuss the results of your genetic test with a genetic professional, either a genetic counselor or a physician with specialty training in genetics. Our on-staff genetic counselors are available anytime. Stay tuned, I will be providing more information about Pathway Genomics, including a review of my testing experience, soon! I am currently a consultant for Pathway Genomics. I am just new to your blog and just spent about 1 hour and 30 minutes lurking and reading. I think I will frequent your blog from now on after going through some of your posts. I will definitely learn a lot from them. I just recently attended a teleconferencing services on topics regarding Genomics. I was wondering if you could help me set-up another web conference on this issue? I will need your expertise on this subject. After 5 months of waiting for my results from Pathway I had them cancel my request. Someone should have them investigated for consumer fraud! Crazy things happen when you walk through the park. Keep up the great blog. Very interesting. A migratory map that is exclusive to your individual ancestral migratory path would be exciting. We are always interested in the latest DNA news.